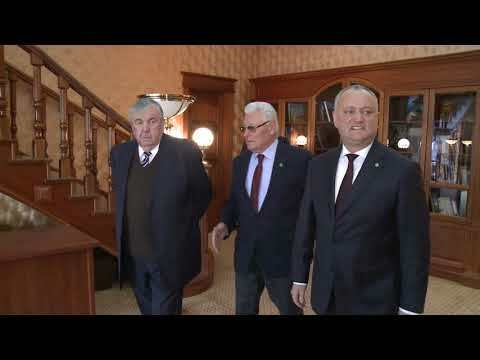 Igor Dodon, together with Mircea Snegur and Petr Lucinschi, who had accepted the invitation, made a brief tour through the building, including the hall where the Declaration of Independence of the Republic of Moldova had been adopted. The Head of state listened with interest to the stories of the two ex-presidents about the historical events, which had taken place in this building. Mr. Dodon mentioned that the invitees had been pleasantly surprised by the current state of the Presidential Administration building, which had been in disaster for nine years, while today it regained its former greatness. Also, Igor Dodon, Mircea Snegur and Petr Lucinschi expressed the hope that future generations would not allow the desecration of state symbols. In another context, the interlocutors shared their views on the situation in the home and foreign policy of the country and the prospects of Moldova's development. At the end of the conversation, Igor Dodon congratulated Mircea Snegur and Petr Lucinschi on the New Year holidays.